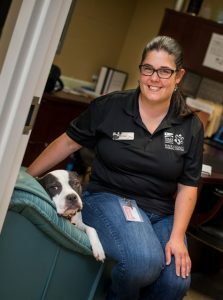 CVM alum Jennifer Federico leads the Wake County Animal Center with tireless and innovative vision. It’s like they’ve been together for years. Jennifer Federico leads Leo, a medium-sized black Labrador and pit bull mix, out to a large grassy area behind the Wake County Animal Center. They call this the dog park, one of many new additions overseen by Federico as the center’s director. “Come here, buddy!” Federico warmly beckons as Leo runs off to find a chew toy. Federico laughs as she plays with Leo. His tail never stops wagging. “Can you sit?” she asks him. And he does immediately. “What a smart boy!” she says. Leo is smart. He’s also the perfect level of feisty and obedient, waiting patiently for Federico to throw the toy in their game of catch. When he brings it back, he lays it at her feet and gently nudges her legs to say he’s ready for more. Leo is waiting for a home. But out here, for this moment, Leo is her dog. Federico, the first director in the center’s history who’s also a trained veterinarian, has been here for over five years. A 2008 graduate of the North Carolina State University College of Veterinary Medicine (CVM), Federico, 39, first came to the center in July 2011 as a contract veterinarian. Less than a year later, after a national search, she was hired as Wake County’s animal services director. During a tour of the center, nestled on a hill off a winding road halfway between Raleigh and Knightdale, Federico proudly gives an overview of some of her ideas that have become realities. There’s now a larger quarantine area for animals with various illnesses and a new behavior room where volunteers and staff work with dogs using techniques rooted in veterinary behavioral medicine. Federico is eager to point out small details making big differences. An area that houses cats implements “hide boxes,” designs that let fearful felines conceal themselves from the eyes of other animals. She points out that an area housing smaller pets — rabbits, ferrets, hamsters, mice — is filled with cages donated by volunteers. There are larger game-changers. Across the country, it’s rare for a shelter director to have veterinary training, but it’s also rare for a shelter to have a chief veterinarian on staff. Wake County’s shelter does — Sandra Strong, another CVM graduate. There are also several vet techs on staff. It’s not just spaying and neutering that happens at this shelter. There’s radiology and treatments for everything from upper respiratory infections to surgery to remove an eaten sock. On the day of this visit, there was even a pig. “I like to do different things all the time, so it’s cool here,” says Federico, who lives in Apex. “I’ve gotten to work on design projects, the dog park, pitching ideas to county managers, working with our legal team. What Federico does is impressive. Her duties are daunting. It can be emotionally taxing. It’s also something she describes as the perfect job. 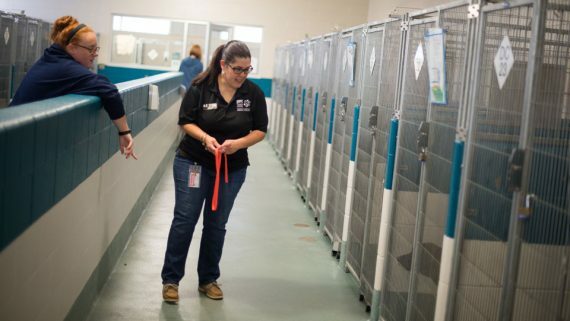 The shelter takes in about 12,000 animals a year —hundreds during some weekends alone — including those picked up by animal control officers in Cary, Raleigh and Garner. Every animal that comes through these doors gets photographed, vaccinated, treated for heartworms and given a name. Federico oversees 40 employees and has a $3 million budget. Volunteers help this place run smoothly, as well. Last year, nearly 18,000 volunteer hours were spent here. Almost 4,000 pets were adopted last year, with over 1,300 being reunited with owners. 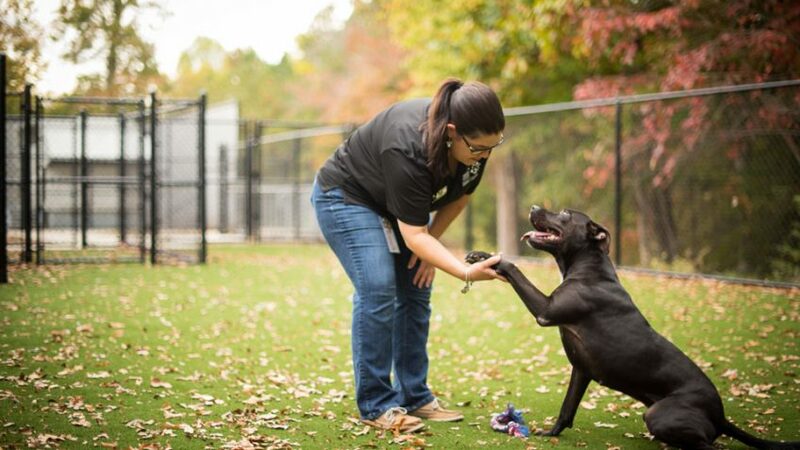 In the same year, about 2,700 animals were placed with the Wake County Animal Center’s transfer partners and 1,700 animals were taken in by foster parents who open their homes to pets before they find a permanent home. There are cases that are successes, there are cases that are heartbreaking and there are cases that are both. In the past, euthanasia protocol was mismanaged and misguided, Federico says. Now, she says, euthanasia rates have sharply fallen during the past few years of her tenure. There’s more. She and her team are often intimately involved with various aspects of animal welfare cases, particularly those involving hoarding and abuse. Every night, Federico is on-call for emergencies. “We see the worst of society in our cruelty cases and the best of society in our volunteers,” says Federico. She’s the type who will answer work emails at 1 a.m. and has never been afraid to push a project she believes in. Shortly after being named director, Federico presented her plan for a larger and separated quarantine room and it wasn’t cheap. Her first project came with a $500,000 price tag. She works for the government but is far from the typical bureaucrat. Federico is also known for bringing animals with her to official county meetings — sometimes that’s requested, sometimes it’s not. But it is now pretty much expected that when you meet with Federico, even in a buttoned-up government building downtown, you’ll likely be meeting one of her dogs. She has five at home. All were adopted from the Wake County Animal Center. One of those dogs, Mister Peters, a 7-year-old pit bull mix Federico adopted in 2011, sleeps on a large chair in her office, waking up occasionally to greet visitors with a tail wag and an affectionate lick or nuzzle. Mister Peters, an unofficial animal center mascot of sorts, is a blood donor at the CVM. But punching numbers was originally what Federico wanted to do with her life. She grew up in Farmingdale, N.Y. — “an average Long Island town,” she says — and had horses since she was 16, but hadn’t always included animals in her career plan. Instead, Federico pursued a math education degree at the Long Island University’s C.W. Post campus. Animals were never far away. Her family always had pet at home, and those were always adopted from shelters. While in college Federico would bring along her black lab to keep her company during organic chemistry class. She still owns the second horse she got when she was 17. But she loved numbers and math’s exactitude. Then, during the last semester of her senior year, plans changed. Soon she was gobbling up much-needed pre-vet requisites (it took two years to finish those) and visiting veterinary schools. She didn’t find the perfect fit until she visited NC State. A big impact on her decision was seeing the Teaching Animal Unit. For someone so eager to delve right into a veterinary career, the campus was heaven. Her focus was horses; her career goal extremely specific. In the first week at vet school, she wrote that she wanted to eventually practice chiropractic care and acupuncture on upper-level competition horses in the Northeast. She was always invigorated by the hands-on particularly through working nights at the large animal hospital even though her shift always followed a packed day of classes. She loved the specialized “selectives” sessions offered by the school to complement the required classes for graduation. Shelter medicine wasn’t on Federico’s radar; she still wanted to work with horses and her favorite subject was dermatology. But after graduation she found jobs with two corporate veterinary practices that ended up not being good fits. One job lasted two years, the other just one. So she, as she often does, went rogue. Federico left that second job without a new job waiting for her, originally planning to get her master’s degree in nutrition. Then she found the job at the animal center. “As much as I try to plan things, a lot of it in my life has just come about surprisingly,” she says. “But I think it has all led me to where I am today and I am the happiest I’ve been in a job. I love what I do every day. I love the people I work with. I love the animals I get to help. And I love doing different things. Perhaps the closest thing to getting into Federico’s brain is looking at her desk. There’s a kind of organized chaos here, with papers and notebooks strewn about. Folders and notes jut every which way out of a stand-up organizer to her left. Her plans and projects are all here, but Federico is the kind of person who also keeps a tally of current and future to-dos on her mind. These are chronic lists, updated and added to all the time, of what she calls “wishful thinking.” Under her watch, they aren’t likely to just remain wishes for long. She talks about future revamps of animal enclosures and the importance of implementing small yet novel changes to routine. Currently, a massage therapist comes to the center every other week to help high-stress dogs and volunteers take dogs on off-site walks for miles so animals can leave the shelter’s confines. Because of these techniques and others, Federico says she’s seen a raise in adoption rates of various animals previously seen as unadoptable. She talks about projects that could happen a decade from now, like building a much larger center. In the same breath, she talks about installing quieter hinges on cages to help animals become less fearful of their surroundings. Federico also hopes to encourage more veterinary medicine students and graduates to consider careers in shelter medicine. The Wake County Animal Center often hosts students from the CVM doing mini-rotations. But the bigger picture for Federico, and one she says is the key to a successful shelter, is community outreach. “We can only do so much in the inside of our building. We need to get out into the community because these animals are all coming from these communities,” she says. “So I’m always thinking about how we can get out there and reach the people who need it, whether through spay/neuter education and rabies vaccinations or teaching preventative care and responsible pet ownership. Federico’s personal goal is promoting adoption of pit bulls. Her perfect day, she says, would be seeing people come to the shelter to fight over adopting one pit bull. One dog Federico won’t have to worry about is Leo. 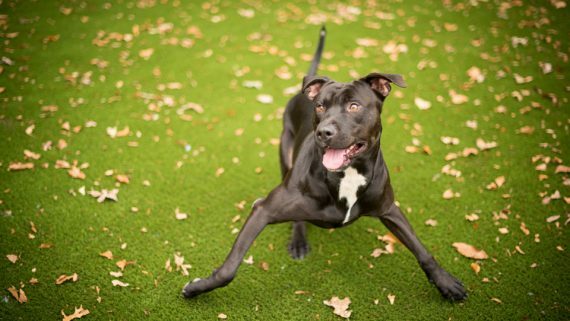 A few weeks after the played together in the dog park, Leo was adopted. Federico likely won’t ever see Leo again. And here, that’s a good thing.